Sugar alcohols are non-sugar sweeteners also known as polyols. In general they are less sweet than sucrose and are often referred to as sweet carbohydrates. They are hybrids of sugar molecules and alcohol molecules but don’t actually contain any alcohol. The sugar alcohols xylitol and sorbitol are both found naturally in berries, fruits, vegetables and mushrooms. Commercial products that contain sugar alcohols must list it in the ingredients and in the carb count on the nutrition facts label. Erythritol is used in low calorie foods. It has almost no calories, is about 70% as sweet as sucrose and doesn’t appear to cause gastro problems. 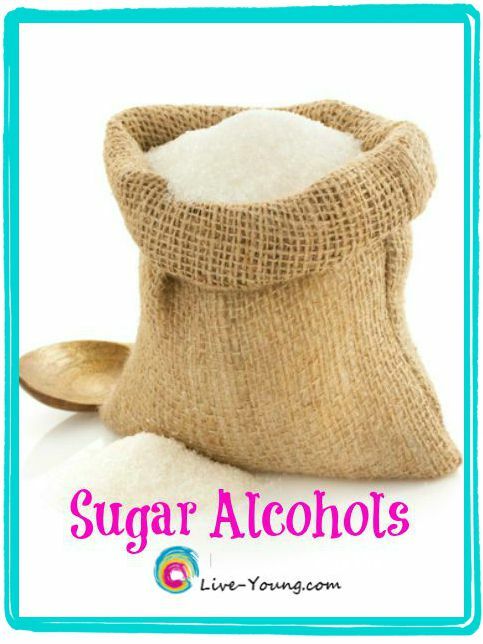 It’s the only sugar alcohol the body absorbs rather than passes to the colon for fermentation. It also doesn’t affect blood sugar or insulin. Maltitol is used in sugar-free desserts, candy and other products. It’s 90% as sweet as sucrose with half the calories. Once it reaches your colon the bacteria will start fermenting causing bloating, abdominal pain and even diarrhea. Blood glucose and insulin affects are minimal. Sorbitol is used in diet sodas, sugar-free ice cream and desserts. It’s half as sweet as sucrose so consumption may be greater to attain a level of sweetness. It doesn’t appear to affect insulin or blood glucose. Xylitol is the favorite choice for sugar-free chewing gum companies. Some other products include; cough syrup, toothpaste and chewable vitamins. It tastes like sucrose with half the calories, minimal effect on blood sugar and none on insulin levels. Provides a dietary fiber with a prebiotic effect feeding friendly bacteria to the gut. May increase bone mineral content protecting against osteoporosis. Studies have shown an increase in skin collagen production. Digestive problems are the main concern with sugar alcohols especially when consumed in large amounts. Gas, bloating and diarrhea are the most common symptoms with sugar alcohols. The body doesn’t digest most of them causing it to travel to the large intestine where it’s metabolized by gut bacteria. People with irritable bowel syndrome (IBS) may want to avoid sugar alcohols. What has been your experience with sugar alcohols? Do you think they are a healthier sugar replacement? When shopping for healthy foods my hypoglycemia (low-blood sugar) is always on my mind. So I’m thrilled to have found low-glycemic products with erythritol!